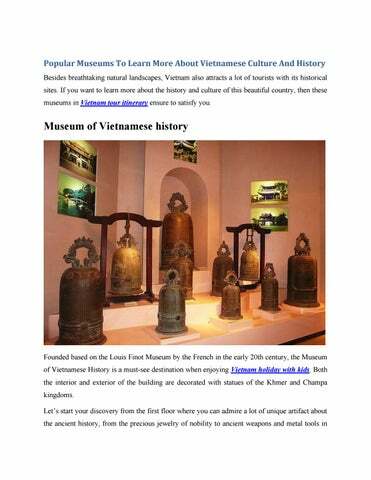 Popular Museums To Learn More About Vietnamese Culture And History Besides breathtaking natural landscapes, Vietnam also attracts a lot of tourists with its historical sites. If you want to learn more about the history and culture of this beautiful country, then these museums in Vietnam tour itinerary ensure to satisfy you. the New Stone Age. You also have the chance to get closer to the graves containing real bodies. On the second floor, you can see exhibits of bronze carvings of Vietnamese villages, the woodblocks used to print Buddhist scriptures, or crafted pottery artworks from the Nguyen Dynasty. the Vietnam War with topics of American soldiers slaughtering and torturing people or spraying toxic chemicals and bombs to destroys North Vietnam. Artifacts such as airplanes, cannons, tanks, guillotines and two "tiger cages" compartments are built in the same size as Con Dao prison. It will be a significant omission for those who want to learn more about the diverse Vietnam culture when taking Vietnam luxury tours without a visit to the Vietnam Museum of Ethnology. The museum is a miniature about the history and culture of 54 ethnic groups in Vietnam with a variety of unique customs. These artifacts are displayed in many different categories such as clothing, jewelry, musical instruments, religions, beliefs, and other spiritual activities. From outside, visitors will be attracted by the exact and logical layout from the form to the content of the museum which quickly sees the own cultural colors of each ethnic group. The Bronze Drum building is the place where you can learn about the identity of 54 ethnic groups, whereas the outdoor area presents the typical stilt houses of Tay, H'mong, Thai, Dao people, etc. Letâ&#x20AC;&#x2122;s come and explore yourself to understand more about this heroic country. A lot of fascinating experiences are waiting for you. Have a nice trip!